The Crown of Napoleon III was a crown that was made for Napoleon III, Emperor of the French. 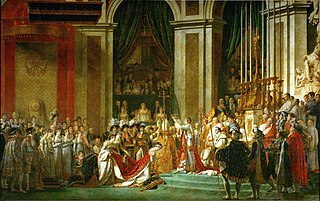 Although he did not have a coronation ceremony, a crown was made for him on the occasion of the 1855 Exposition Universelle in Paris. The gold crown had eagle-shaped arches and others in the form of palmettes, set with diamonds, and topped by a globus cruciger. During the same period, a consort crown was made for his empress consort, Eugénie de Montijo, which is known as the Crown of Empress Eugénie. 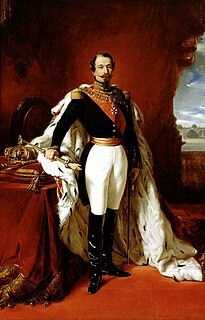 After Napoleon III was overthrown in 1870, following the Franco-Prussian War, he and his wife lived in exile at Chislehurst in England, where he died in 1873. Most of the French Crown Jewels were sold by the Third Republic in 1885, including the Crown of Napoleon III. However, the Crown of Empress Eugénie was returned to the former empress, who bequeathed it to Princess Marie-Clotilde Bonaparte. It subsequently came up for auction in 1988, after which it was donated by Roberto Polo to the Louvre museum in Paris, where it is now on display. ^ Empress Eugénie's Crown, Musée du Louvre. ^ The Crown of Empress Eugénie, Fondation Napoléon. Hortense Eugénie Cécile Bonaparte, Queen consort of Holland, was the stepdaughter of Emperor Napoléon I, being the daughter of his first wife, Joséphine de Beauharnais. She later became the wife of the former's brother, Louis Bonaparte, King of Holland, and the mother of Napoléon III, Emperor of the French. She had also an illegitimate son, The 1st Duc de Morny, by her lover, the Comte de Flahaut. Eugène Rose de Beauharnais, Duke of Leuchtenberg was the first child and only son of Alexandre de Beauharnais and Joséphine Tascher de la Pagerie, first wife of Napoleon I.
Doña María Eugenia Ignacia Augustina de Palafox y KirkPatrick, 16th Countess of Teba, 15th Marchioness of Ardales, known as Eugénie de Montijo, was the last Empress Consort of the French (1853–70) as the wife of Napoleon III, Emperor of the French. The Tuileries Palace was a royal and imperial palace in Paris which stood on the right bank of the River Seine. It was the usual Parisian residence of most French monarchs, from Henry IV to Napoleon III, until it was burned by the Paris Commune in 1871. 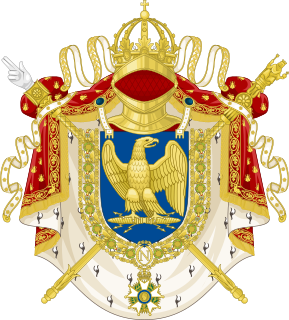 Emperor of the French was the monarch of the First French Empire and the Second French Empire. The Crown of Empress Eugénie is the consort crown that was made for Eugénie de Montijo, the empress consort of Napoleon III, Emperor of the French. Although neither she nor her husband had a coronation ceremony, a crown was specially created for her on the occasion of the 1855 Exposition Universelle in Paris. 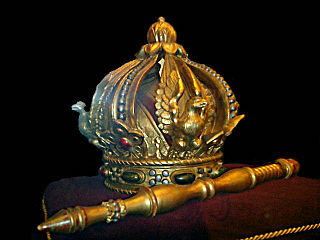 The gold crown is set with diamonds and emeralds in eagle and palmette motifs, and it is topped by a globus cruciger. The Imperial Crown of Mexico was the crown created for the Emperor of Mexico on two separate occasions. Hector-Martin Lefuel was a French architect, best known for the completion of the Palais du Louvre, including the reconstruction of the Pavillon de Flore after a disastrous fire. The Napoleon III style was a highly eclectic style of architecture and decorative arts, which used elements of many different historical styles,and also made innovative use of modern materials, such as iron frameworks and glass skylights. It flourished during the reign of Emperor Napoleon III in France (1852–1871) and had an important influence on architecture and decoration in the rest of Europe and the United States. Major examples of the style include the Opéra Garnier in Paris by Charles Garnier (1862–71), the Bibliothèque nationale de France. and the Church of Saint Augustine (1860–1871). The architectural style was closely connected with Haussmann's renovation of Paris carried out during the Second Empire; the new buildings, such as the opera, were intended as the focal points of the new boulevards.